Belostoma sp. 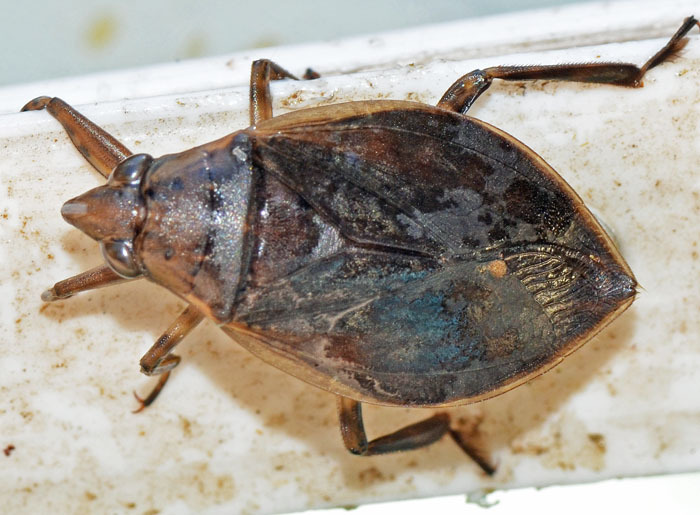 (Giant Water Bug). Size: approx. 20 mm. Photo: 09/21/14, 2 pm. I found this Giant Water Bug in our swimming pool. I am very happy that I had a chance to take this picture and admire the amazing diving speed of this bug. Unfortunately adults "can inflict a painful bite if handled", which is less cool but explains the alternative name "Toe Biter". Luckily the bugguide also states that they "usually play dead when captured". Females attach their eggs onto the backs of males. They are widespread and have eight species in North America.